If you are familiar with this blog, you would be able to guess that I absolutely dig opportunities that let me travel to one of the many national parks in India. These nature reserves preserve and showcase the unparalleled biodiversity that India possesses. The dizzying array of flora and fauna in the Indian jungles can be represented by one iconic animal – the Royal Bengal Tiger. The sight of a tiger cooling off in a water hole, confident and unfettered, and then walking with a nonchalant swagger, that only the powerful can have, and turning his gaze at the beholder for the last time before disappearing into a bush as if to say “Hey! What’s so interesting? I am just being a tiger”, evokes emotions so profound that are indescribable in words. The thrill in tracking a tiger through alarm calls and pug marks and then becoming suddenly aware that there is something lurking in the surroundings but not being able to see it cannot be matched by even the best of spy thrillers. Sometimes, you can have a “tiger experience” even when you don’t see a tiger but merely feel its presence. I feel fortunate to have had a few such tiger experiences. The gizmos and the networks of the information age have made it easier than ever before to share such experiences with a large audience. However, the inherently viral nature of social media coupled with the captivating nature of the tiger’s persona have lead to an explosion in the number of visitors wanting to visit our tiger reserves each year. A lot of people who visit our jungles in the hope of a tiger sighting do not do so for the tiger experience I just described, but only for self gratification. All some people want is a picture of a tiger for a Facebook post. There is nothing wrong in posting a picture of a tiger on Facebook. But if you have visited a tiger habitat and have learnt nothing new about the big cat, its habits or the environs it lives in then, perhaps, you should try the tiger experience again my friend. I have seen tourists singing songs, gorging on munchies, feeding wild animals and show utter disdain for the rules that govern our protected forests. And it makes me angry. Really angry. 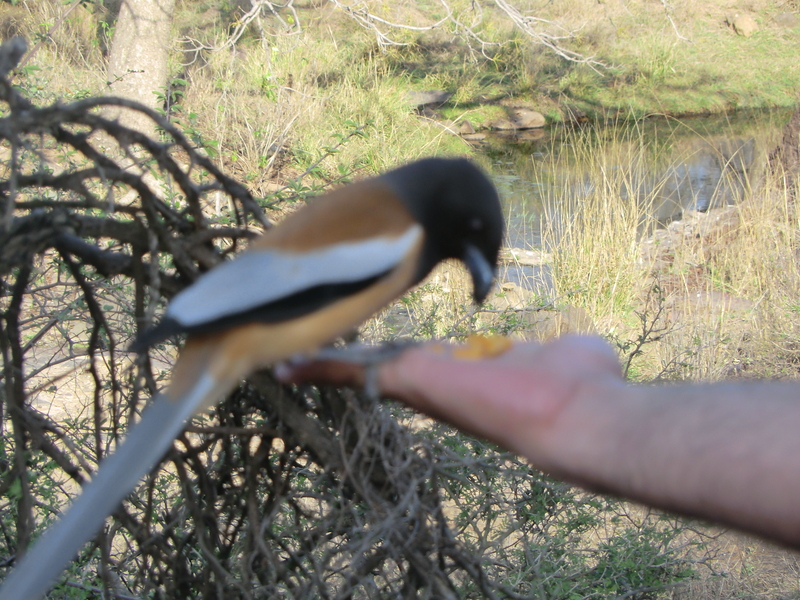 On a recent visit to Ranthambore, I saw tourists feeding potato chips to birds. One idiot even offered to a deer fawn! I tried to make the guide intervene but he conveniently looked away. The worst part is that it is the educated urban middle class that does this. The poor folk who live on the periphery of the forest have more respect for nature than some of us. By us I refer to the self righteous middle class of our society. Perhaps we have become so cocooned in our urban lifestyle that we forget that our basic needs are still provided for by nature. And that is how it will always be. I feel pity for a soul so numb that doesn’t miss a beat when it hears a twig snap in the bush but cannot see what caused it, whose heart isn’t filled with the songs of the many birds that inhabit our jungles, someone who doesn’t feel the freedom of the cool jungle breeze. People, surprisingly, can be totally oblivious of nature’s beauty even when in the lap of Mother Nature. The madness in wanting to see the tiger and ignoring the elements that make a tiger , well a tiger, really gets on my nerves. I have seen families misbehaving with guides in their disappointment of not sighting a tiger. I have seen groups of young people ( the same youth that are projected to be the embodiment of hope for India) resort to being unruly at the fag end of their safari when all hopes have disappeared. I wish I could tell them I saw a tiger in Ranthambore, after our canter had exited the reserve. I wish I could them that it is the unpredictable nature of a tiger sighting that makes it such a prized experience. I wish I could tell that pictures of the mountains and the waterholes , of colourful birds and pronking black buck can be just as beautiful. The picture of a tiger experience is incomplete without all these elements that complete a tiger. Without all these sights to enjoy, there is no difference between seeing a tiger in a zoo and a tiger sighting in a national park. And as the expectations of a guaranteed tiger sighting reach a crescendo, the chances of a real heart stopping tiger sighting diminish. Thanks Sahil. Hope you have a great sighting. Would love to hear more about your trip. Thanks Ananya. Glad you liked it :). Nice article sir, I love to read this types of articles. Thanks a lot to share with us……Ind Govt Jobs, Latest Banking Recruitments, Latest Employment News.